Below is a proposal I wrote to my Condominium Association Board and Members January 27th 2011. The following is a proposal for insulating our building’s hot water tanks. Insulating the two hot water storage tanks and pipes will cost $3,200, provide more than $1,371 annual energy savings, and provide an annual return on investment of more than 43% (less than 2.33 year payback period). I urge the Board and fellow condominium association members to support this investment; it is rare to find an annual ROI of more than 43%. Boiler requires well ventilated room . Ventilation required to constitute combustion in water heater. 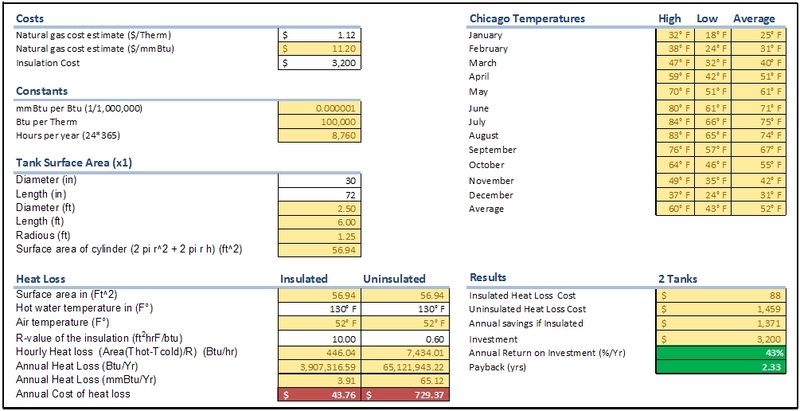 Pipe insulation was included in the cost, but not in energy savings. Includes: 2 custom tank jackets, 120 ft of pipe insulation, and labor.